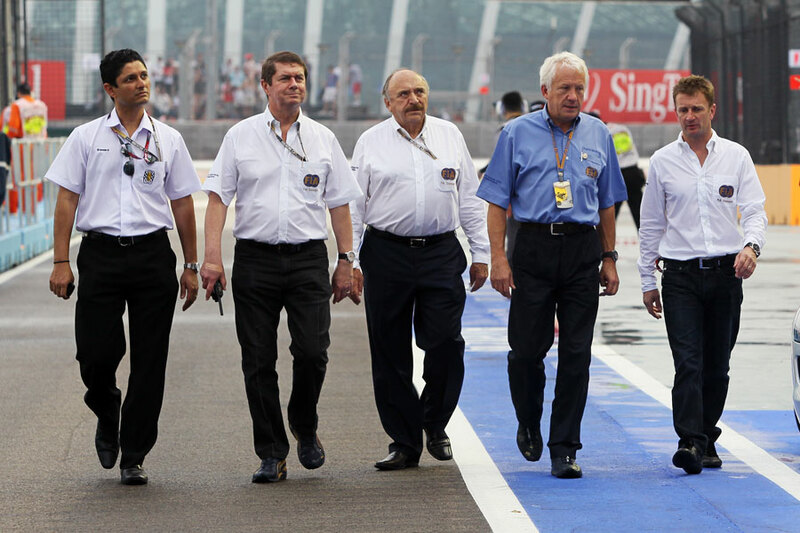 I like this picture of all the FIA stewards walking down the pit lane with FIA race director Charlie Whiting. They look like a bunch of cowboys or pilots with helmets under their arms walking along and I’m sure you’ll recognise ex-Toyota F1 driver Allan McNish on the end. Stewards are almost becoming celebrities in their own right in the paddock because of all the decisions they are making these days and stories like Charles Pic getting community service. It’s very rare to see them all together and I think they’d been out to inspect the kerbing and the painted markings on the circuit. They were checking the grip level of the paint in the pit lane where the Allianz branding is painted, which is done each race, because when it rains, which it did ahead of the first session on Friday, it becomes quite slippery. After the race the stewards were kept very busy investigating all the incidents and the media centre was kept up to date by the FIA media delegate Matteo Bonciani relaying each decision over the tannoy. So rather than the media waiting for each decision to arrive, he actually told people and explained the reasons, which is very useful if you are busy at your desk working. This is what the media wants. We want openness and decisions like that should be immediately out in the open. 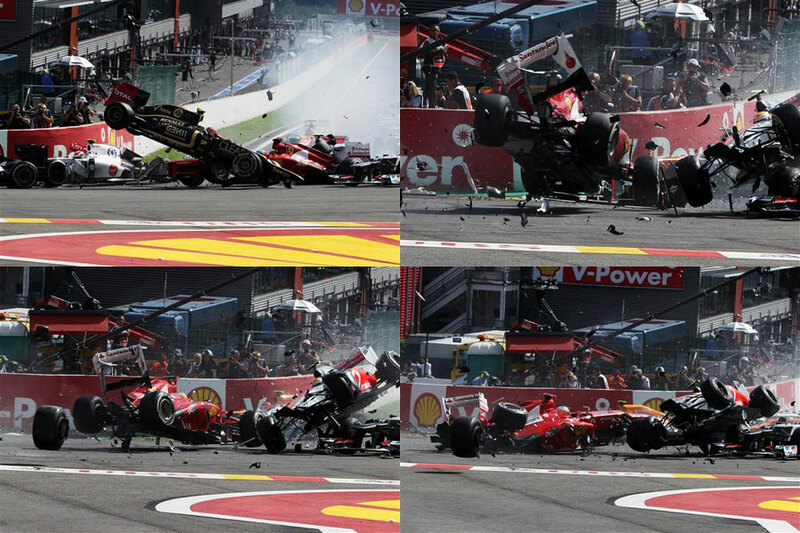 If this sort of thing happens at every race it would be great. 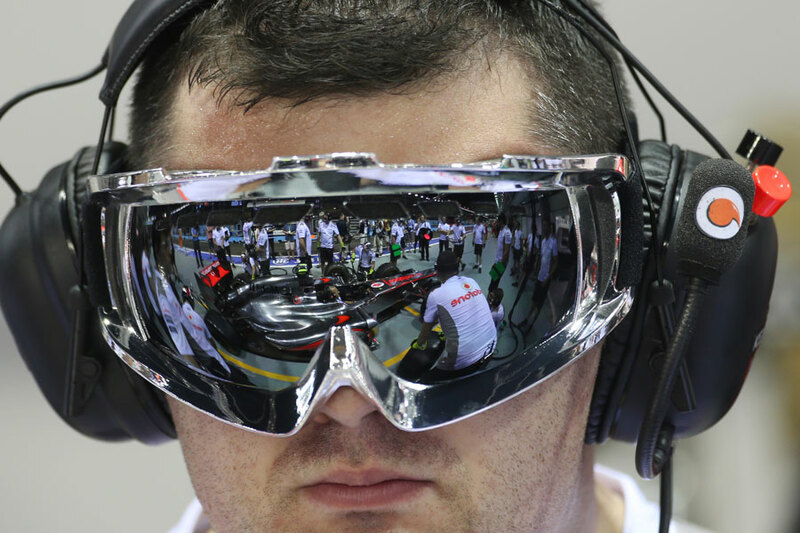 This was taken while McLaren was practising its pit stops on Thursday night. The teams were constantly practising their pit stops and obviously the dark conditions do put a different sort of feel on it all. They do have to work in a lightly darker area because it is quite bright in the pit lane but not necessarily towards the garages. The lighting in the garage is all you get, so it is quite dark in there as you can see towards the right of the picture with it brighter out towards the track and grandstands. It’s nice to get these photos with their reflective visors and for them it stops the glare getting in their eyes. In the race they obviously wear their full overalls and when the car stops it does generally tend to overheat and brakes can catch fire after 20 laps or so of punishment on the track. So things are different in the race, but McLaren appears to have hit its stride with pit stops at recent races and have actually broken the F1 record despite the problems at the beginning of the year. This shot was taken after Lewis Hamilton stopped on track and you can see the car is covered in fire extinguisher dust. I first heard of the problem on FanVision when I was walking over the bridge from the first corner and I didn’t realise how close I was to turn five where he eventually stopped. I probably missed the incident by about five minutes and Lewis obviously went straight back to the garage so he wasn’t there by the time I arrived. I saw the car just lying there so I thought I’d pap some pictures off, but the colour of the light was awful because it’s being illuminated by street lights rather than the track lights. I couldn’t really get around that but I thought it was an interesting shot with all the extinguisher dust on it – so much that you can hardly see the sponsors on it. It’s a good picture because it helps to tell the story of Hamilton’s retirement with the car parked on a back street away from the action. This was taken at the end of the race as the celebrations took place down on the podium. 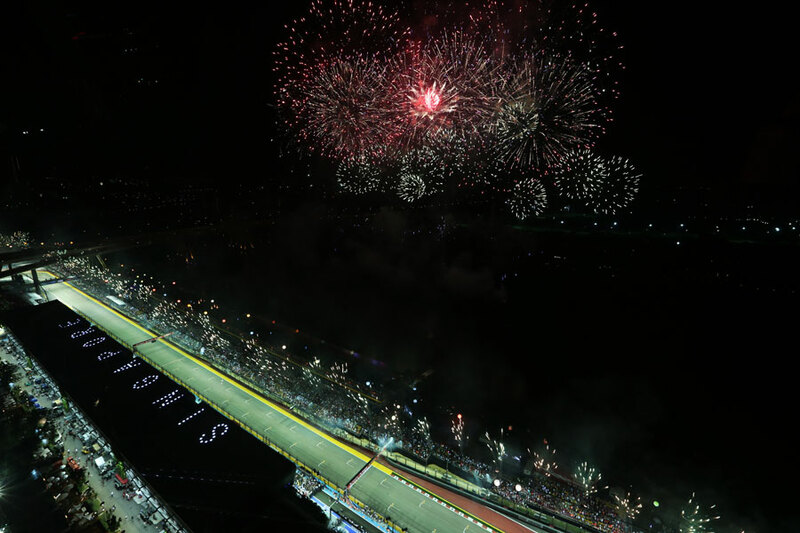 The organisers had asked for a picture of the fireworks so I went up on the Singapore Flyer big wheel to take a picture over the grandstands. It was a bit bizarre sat in the pod knowing that my usual job would be shooting the podium and that after this my job was basically done. But because the Flyer is moving all the time I had to time it right and so I had to leave to get on it five minutes before the race finished and we timed it about perfect. But this photo does highlight the problem of shooting at night because you can’t see any of the background. The area behind the grandstand isn’t a very populated area anyway because it’s not the city itself. What I didn’t know was that there were also fireworks going off behind me and that’s probably the shot to do. Maybe next year we’ll try a photo from the Bay Sands Hotel over the harbour and back towards the track. 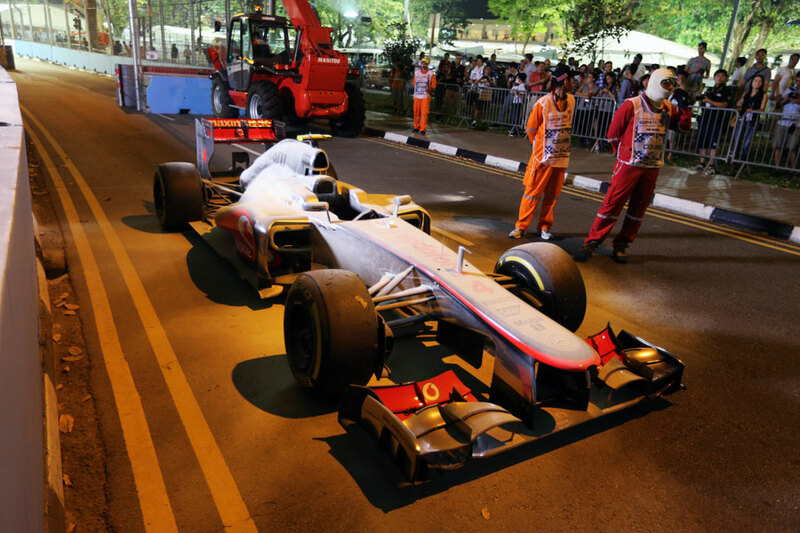 Obviously it was also a celebration of five more years at Marina Bay and it all added to the festival atmosphere. Katy Perry was performing in the post-race concert and it was great to see her on the grid before the race. I saw all these people crowding around a girl and when I got there I realised it was her. I was pushed for time on the grid because there was a tribute to Professor Sid Watkins so by the time I took this shot it was about ten minutes before the race. Usually I’m off the grid by then and I had to rush to get down to the first corner for the start of the race. But it was good to see her on the grid and then afterwards I hear she put on a good concert at the cricket club in the centre of the race track. Could this be the Mercedes dream team? They’ve been good mates and rivals since their karting days and now there’s a chance they could be in the same team together. I took the photo on Friday evening after the drivers’ briefing, which is a good opportunity to get photos of the drivers. But this time there were absolutely no other photographers around because it’s almost like people do their work and they leave because by then it’s the early hours of the morning. I hang around because I always think there is more work to do, but other people just tend to disappear – not that I’m complaining. 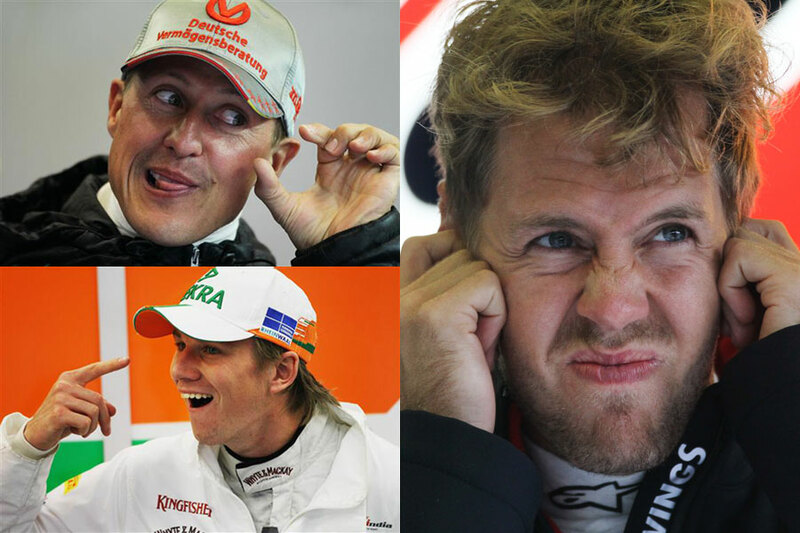 I like these three photos because it’s three Germans all with funny faces. All three were taken during Friday practice when the track was soaked with rain and for the drivers there wasn’t much to do. Michael Schumacher was telling a story to his engineer Jock Clear and test driver Sam Bird and I just took this sequence of frames where he looks like he is miming taking a photo. It was a nice run of photos and obviously that frame is quite humorous. In Seb Vettel’s photo they’ve just started the engine up in the Red Bull garage and he’s grimacing. He was probably quite peeved off because it was bloody cold and you can see he’s wearing a jacket – I suspect he was wondering what he’s doing there as it was a wasted day for pretty much everyone. Nico Hulkenberg was just talking to his trainer and I don’t know what he was pointing to or gesturing. But obviously with stills you catch a moment in time and freeze the action in a way that isn’t really possible on TV or video. Nowadays our cameras can shoot at quite a high ISO to compensate for the lack of light without a loss in quality and all of these were shot with my 500mm lens from outside the garage, so the drivers don’t even know they’re being photographed. I’m sure the drivers hate it, but you get some nice photos and we needed that on Friday with no action on the track. 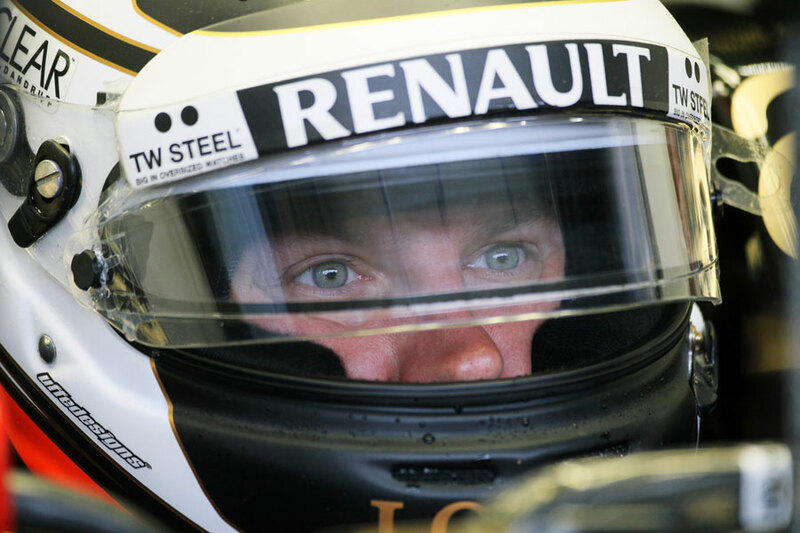 These images were also taken on Friday and the reason I’ve included them is because you so rarely see Kimi Raikkonen’s eyes when he’s in the car. He always wears a heavily tinted black visor and has it tilted down even when he’s in the garage – it’s almost like he has it preset. But of course it was raining on Friday so he had a clear visor on and that allowed me to take what is quite a rare photo! It helps that I had what we call a “flat light” in the garage, where it’s not too bright and you don’t have the usual reflections off the visor. 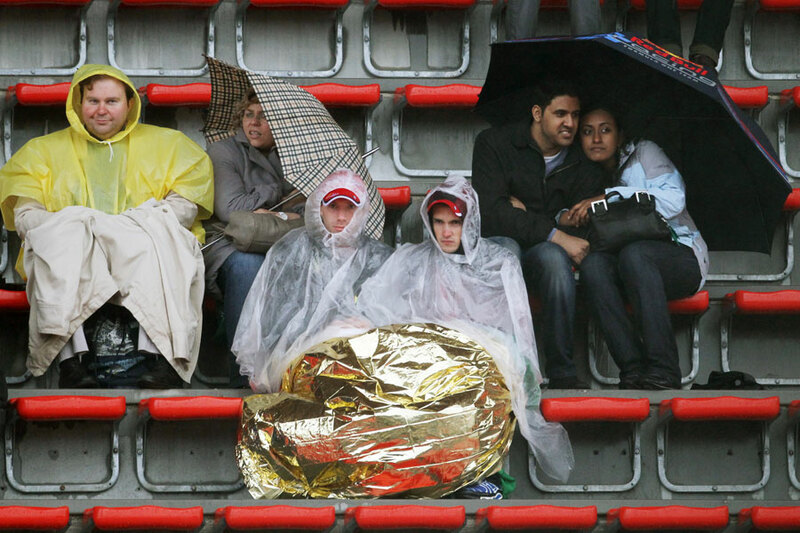 I like this shot of the fans because it really sums up Friday at Spa. It also seems to me that you’ve got different types of fans all in the same shot, with one couple behind an old-fashioned umbrella, some more behind a Red Bull umbrella (as you can see, the rain is coming sideways), and then the two at the front in rain macs and that gold stuff you see marathon runners use. I’d say the two at the front are the die-hard fans, the two with the Red Bull umbrella look like they are from the paddock club because they are quite well dressed and I’m not sure about the other two, they look like locals. It’s quite a funny mix! One funny story that I saw develop in front of my own eyes was the battle between British broadcasters Sky Sports and the BBC. 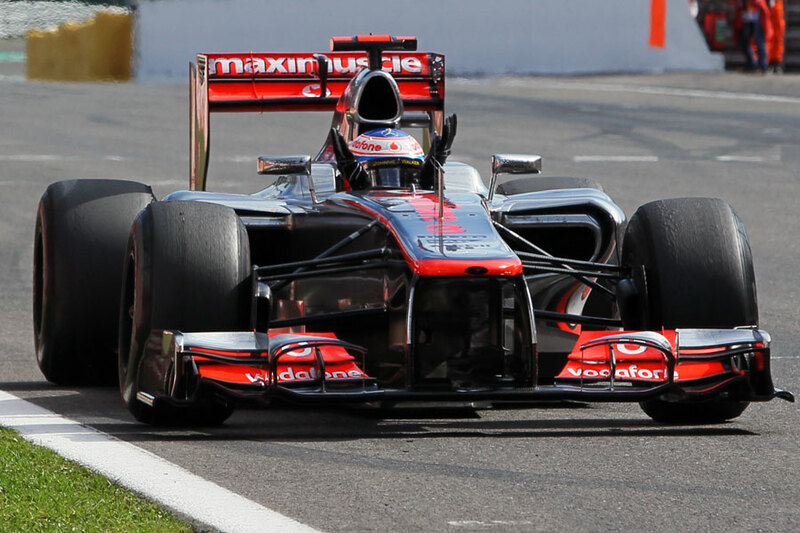 Both had the rights to show the Belgian Grand Prix and obviously both wanted to have a word with the race winner Jenson Button as soon as he was out of the car. The BBC managed to talk to him as soon as he was out of the press conference in the interview pen, but that’s for the pit lane reporters rather than the presenters. So after that Jenson went to do the celebration shot with all the team and literally as soon as they stood up Sky Sports jumped in to the picture to grab him to talk to. Then as soon as Jenson had finished that interview the BBC were back in there again to talk to him with Eddie Jordan and David Coulthard on the red button. It just shows that it’s not just the F1 teams that are competitive. Most of my race was spent in the wire room making sure we got the crash pictures from the start back to the office and out to our clients. As a result I swapped my duties with one of our other photographers as I was going to go up to Les Combes and then back to La Source before the podium. I then decided that I had to take over the responsibility for shooting parc ferme at the end of the race and as I was down there I thought I may as well do a finish shot as well. It actually worked to my favour because there were only four or five photographers there and this nice Japanese photographer let me in below to take a photo in the gap from down low and shot Button coming across the line all the way through. It was great because he slowed down and raised his hands out of the cockpit, which you don’t always see if the top two cars are closer to each other. You get the real emotion at that moment as the engineer comes over the radio to congratulate the driver and you can see here that the emotion is spilling out of the cockpit. It’s difficult to know when you’re shooting a photo like this who is to blame. I captured it from the start and I followed Romain Grosjean as his car flew into the air and I could also see Fernando in the air, but I didn’t really see anything of Lewis. If you look at the frame sequence and how long it took, it probably took five seconds max and if you watch it on TV you don’t really see the height that these guys get, unless you watch it in car. It’s hard to fully see the ferocity of the accident and the explosion of carbon fibre that happens until you see it in a picture. 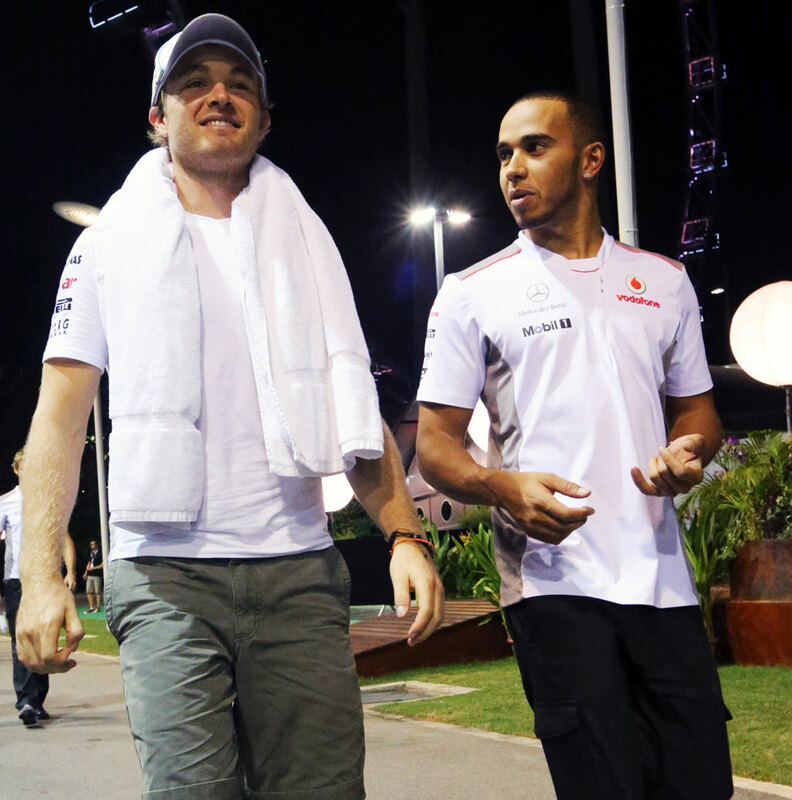 On TV you saw Lewis walking back to the garage with a bit of his car and that’s because he found it in the pit lane! It came off his car with such force that it flew into the pit lane exit by the lights, which is just incredible and actually quite scary.